Would you like to know more about Hungary? See our cultural music and dance? Let’s join to our Folklore and Operetta Show with our Budapest Dinner Cruise. 4-course menu and glass of welcome drink is the part of the basic package. 20th of August is a fantastic day to celebrate State Foundation Day in a luxurious area on Dinner Cruise. Watch the Firework and enjoy a memorable programme during your Budapest Cruise. April is a funny month of the year! We celebrate this month with a lot of traditional things, such as Easter Egg or Sprinkling with water or scent! Join our Danube River Cruise and discover a bit from Hungarian Culture! Did you know that our eye is one of our most important sensory organs, namely 80% of all the information received during the day, is perceived and memorized by our eyes? Furthermore, did you know that our eyes, as one of our sensory organs help to taste the taste of foods and drinks? So officially, tasting in addition to the tongue (and nose) also relies heavily on vision. So how much are we lost in the world without our vision? With us, you can now get an answer in our special wine tasting game, where everyone can be attended over the age of 18, whether they are an amateur or a professional wine consumer. The pleasure of the fun atmosphere and the joyful discovery is guaranteed. Join our Wine-casino game and experience your skills of wine tasting while enjoying a fun night on the Danube floating on an exclusive, well-designed catamaran and enjoying the charm of live music while admiring the illuminated Budapest. During the 3-hour river cruise, we offer for this wine tasting event that our dear guest has the opportunity to become real players who can test and improve their knowledge of wines. Try it yourself, but do not get overconfident by your knowledge, because this method – we experienced it many time - can even fool the professional wine experts as well. However we offer you a great evening with a lot of excitement, please do not forget, our wine tasting game is not a casino game, where you can win money. 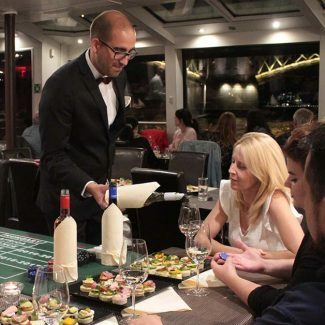 It's an interactive wine tasting that is based on casino gaming and the purpose of it is entertaining and educating for those who love wine, all in an exclusive setting, while floating on the Danube, with pleasant live music. An important part of the wine tasting ceremony is the snack (finger foods) between two glass of wine. Since each wine has a characteristic and unique taste professional wine expert use savory snacks to naturalize the taste of the previous wine. We will do the same and will serve you some delicious finger foods between two glass of wine, even, we will explain to you which snack is matching best with the current wine to strength up the aroma and make the feeling of the taste even more memorable. Additionally, you have on the plate, Lemon marinated chicken mouse, Vegetable batonnets , Eidam cheese, and Grissini stick for example. How do we play our Wine Tasting in Budapest? You can apply to be a player individually or in groups as well. There are at least 2 people in the game, but if you are already 4 of you together, it is especially enjoyable, but you can get up to 10 because our tables can be comfortably utilized for up to 10 people. Our guests are awaited by our hostesses and upon arrival, the chips are distributed for everyone equally, so you can manage them during the tasting period and have your tips on the table where wine-specific issues are listed. The value of your chips will reflect the price of the wine casino, so basically you have the chance to use your money twice during the evening, isn’t is fair? Getting comfortable: At the start of the game, everyone can „hide behind the face” of famous characters, enhancing his mood and helping to get to know better the other members of the game, since all of you will get name cards -and who knows, maybe one of your neighbors will be named after Zeus and you will be Mr. Bean. Introduction: First of all the referee will introduce you the rules of the game than you will get a short introduction of the Hungarian wine regions since all the wines will be tasted during the evening are selected from the 7 wine region located in Hungary. Taste and guess: At the beginning of the game we will fill the first round of wine from a covered bottle to black wine glasses - making it harder for you to recognize even the color of the wine– and the game begins. After the wine has been examined - which consists of a thorough smell and taste sampling, given that we offer wine in darkened cups, thus preventing the visibility of the color of the wine - the participants in the game are guessing/accepting the perceived characteristics of the wine listed on the table. Enter your bet: After wagering, the croupier reveals the wine and until you surely finish the rest of your wine he tells you in detail about the current wine or shares the specialty of the variety with the audience. This "Education" is strictly a pleasure to serve, there will be no exam and we will not dare to enter the boring details while explaining the secret of the wine. Disclosure of Reality: After the prizes have been paid, the next round of betting and tasting is started. Of these, there will be a total of 7, which will be in a pleasant, good mood under the guidance of the experienced croupier. Our team's goal is to make everyone feel good about playing this wine tasting game (no matter how mixed is the team of winetasters) so that players can enjoy studying each step of the wine's enjoyment while the craving of the game grows steadily, even if they are more experienced wine consumers. At the end of the game, when each round is completed, the winner (s) can win their prize - this is yet a secret until the prize is awarded. It's important to note that players are playing for pleasure and experience because the chips do not have the value of the money and can not be redeemed. BUT as we want to be fair and want you to enjoy the chips you collected during the game with your cleverly tactical playing style, we offer you another opportunity. Collect all your chips, even trade them between each other and buy a bottle of wine together (even with other players) for the rest of the evening. If you managed to double the number of your original chips, you earned a 10% discount from the price of the bottled wine’s prices. In case you earned so many chips, that the value of it reached 100.000 HUF (around 320 euro) it brings you 20% discount. Think about it and collaborate with the potential Amadeus Mozart or Ariel (The mermaid) at the table and have fun together while enjoying the view and the live music and of course the wine in the rest of the cruise. During the Game you can take advantage of the bar, either to enjoy the favorite wine you have just tasted or to buy your favorite creations on our boat. And of course, do not forget, among the tasting rounds, there is the possibility to eat some snacks. We recommend our casino based party game and wine tasting program for team buildings, stag party, even for a family celebration (of course, only if everyone has the minimum age of at least 18).